Misty rain is falling from the dense foliage overhead as I walk the jungle trail to a temple sanctuary. The forest is alive with strange sounds. The shrill staccato buzz of cicadas is dominant but every now and then I’m alarmed by a loud squawk as a brightly coloured parrot dives across my path. It’s late in the afternoon when I finally break out of the trees. A great mountain of moss-covered stone masonry rises up before me to the height of the jungle canopy. I have reached the ruins of the mystical Ta Prohm Monastery near the city of Siem Reap in Cambodia. I have entered the temple complex from the east. This was tiger-hunting country before the temple was rediscovered last century. Explorers stumbled over ruins that were engulfed by kapok, banyan and fig trees and a mass of creeping vines. The structure was completely hidden from view by the dense vegetation. I walk carefully over a collapsed causeway across the moat. Clambering over jumbled blocks of stone I penetrate deeper into the ruins, feeling like a pioneer archaeologist exploring a long lost empire of the Khmer people. Ta Prohm is truly the remnant of a great empire ruled by Cambodia’s most influential king, Jayavarman VII. This monastery was dedicated to his mother and housed twelve thousand people within its grounds. In the 13th Century the monks earned a living by supplying medicines and provisions to 102 hospitals that the king instituted throughout Cambodia. I move deeper into a colonnaded gallery and notice that the light is fading fast. In the heart of the complex the side galleries and secret recesses are darkening and sculptures are gradually fading eerily into the shadows of dusk. Many narrow passageways end in great jumbled heaps of squared stone. In the gloom I fancy that the statues of Naga, a hideous seven-headed mythological creature, are moving towards me in a menacing way. Ghostly apparitions appear in every doorway. I suddenly feel abandoned in an alien world, surrounded by the whole panoply of Khmer demons. When I emerge into the northern enclosure I’m dumbfounded by the sight of giant Kapok and Banyan tree roots climbing up the face of the temple wall inextricably entwined with the masonry. They are literally strangling the stone structure to the point of collapse in a hopelessly overgrown and magnificently destructive way. This is nature in the raw in a life and death struggle with the ancient works of mankind. Khmer ancestors tamed the jungle and created these great monuments to their gods. Now the smooth grey tentacles of the forest trees are reclaiming what rightfully belongs to them, obliterating every trace of human endeavour. This mysterious, lost-in-the-jungle complex is so intriguing and darkly enchanting I have lost all sense of time. When I hear the sound of a laughing girl’s voice I begin to think I’ve lost all sense of reality as well. The action-adventure movie, Lara Croft Tomb Raider was filmed here. The scene where a laughing girl directs Lara (Angelina Jolie) to the jasmine plant that unlocks the secret to the tomb comes to mind. This very spot is where the actress entered the temple under the clinging grey roots. The scene is so atmospheric with the deepening shadows and the uncanny silence, that I can almost feel that the spirit of the fearless tomb raider is here with me. ? ?In a real sense the spirit of Angelina Jolie is still here in Cambodia. The screen goddess was so enamoured of the country and its gentle, warm-hearted people she adopted a Khmer child. She has invested millions of dollars into landmine clearance and environmental works. The government even passed a special law to allow the talented actress to become a citizen and buy a house here. It makes a beautiful sequel to the tomb raider story. The big screen actress frustrated the Illuminati by capturing the Triangle of Light in the movie and now spreads light and hope to the small villages of one of the world’s poorest countries. They say that it’s always ‘Temple Time’ in Siem Reap, the gateway to all the ancient Khmer ruins, so the next day I board a motorised tuk-tuk to visit the other monuments starting with the ancient capital of Angkor Thom. The imposing south gate of Angkor Thom also featured in the tomb raider movie. The bad guys recruited local labour to pull down the great entry doors and enable them to enter the hidden tomb. The good king Jayavarman VII used this temple to unite his people by combining the Buddhist and Hindu religions. Four benevolent faces of the king grace the main tower looking out to the four points of the compass to signify that he was always watching over his people. On the same temple circuit is the remarkable Bayon Temple, where I marvel at the sight of forty-nine Gothic-style towers each bearing four giant faces of the same king, smiling enigmatically. I cannot discern his inner thoughts by studying the faces. His eyes are closed in meditation and his expression passive as if he desired to keep his subjects guessing, but always knowing they are under constant surveillance – a form of ‘Big Brother’ syndrome in the Middle Ages. At the stroke of five o’clock the following morning I’m up and away to see the real biggie, the temple of temples. 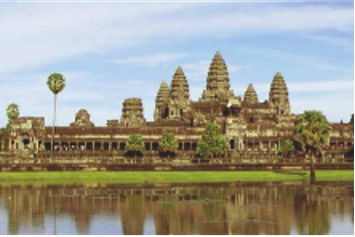 Angkor Wat is the iconic symbol of Cambodia and the largest religious building in the world. Nothing can prepare you for the sight of the sun rising behind the eye-popping silhouette of the five towers of Angkor Wat. Having crossed the stone causeway beside the 200 metre-wide moat, I’m sitting under the lofty gate turrets as the first faint glow of dawn appears. Fingers of pale light creep up behind the towers, which are an incredibly odd shape. They appear as elongated beehive structures tapering towards the top, with strange upturned appendages like the rough spikes of a pineapple. The overall effect is a stunning blend of architectural symmetry and spirituality. As the sun rises, the temple is clearly reflected in the waters of the moat. ? ?With the assembled throng of temple lovers I move into the vaulted corridors of Angkor Wat and admire the seemingly endless walls of intricate bas relief carvings that depict the King’s victorious battles as well as demons, gods, animals and the beautiful apsaras. Apsaras are new to my acquaintance, being voluptuous heavenly nymphs with pouting lips and lithe bodies with a remarkable propensity for performing impossible contortions. The King possessed 600 bare-breasted apsara dancers for his light entertainment. There are thousands of these curvaceous darlings at Angkor Wat and, believe me no two are alike. However, purely by chance I did find one that bears an unmistakable resemblance to a certain goddess of the big screen. ? ?As I moved along the colonnade I would swear that this particular celestial angel was watching me. Call it imagination if you will, but when you come to Angkor Wat to see this mind-blowing temple for yourself then look out for this beautiful Angelina Jolie look-alike, she is simply stunning. Paul Rush travelled to Cambodia with assistance from Adventure World, Cathay Pacific and Bangkok Airways.